If you’ve been following my posts about the CSA we’re doing, you know that I’ve been having these for breakfast almost every morning. And I haven’t gotten tired of them! They’re so easy and super fast. If you get bored, you can also add in new fruits, veggies, flavors, and other ingredients to the mix. 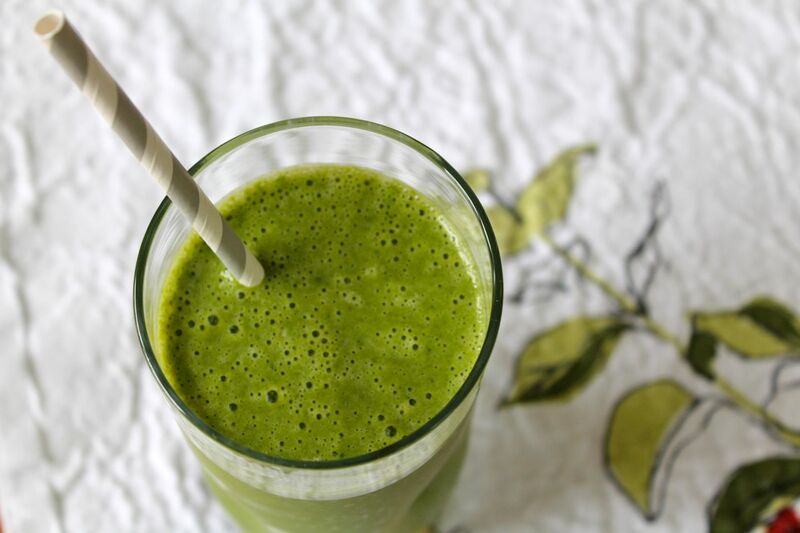 Don’t be turned off by the idea of greens in your smoothie! When you add enough fruits, you don’t taste the greens at all. It tastes like a delicious fruit smoothie, and you get the added benefit of an extra serving of veggies. Kinda like those V8 fruit/veggie juice things. Here’s a few things I’ve learned while experimenting with smoothies. It’s a lot, so if you’re not in the mood to read my dissertation, just jump to my recipe for a basic green smoothie at the bottom. I recommend buying organic greens — since they don’t have a peel or skin, they can absorb a high amount of pesticides and chemicals. For other fruits and veggies, I refer to the Dirty Dozen list (a list of veggies that you should always buy organic). But mostly, I follow this rule: If it doesn’t have a skin (greens) or if I eat the skin (apples), I buy organic. If it has a thick peel that I don’t eat (bananas, citrus, avocado), I don’t bother with organic. I do buy organic dairy products (yogurt, milk, etc). I have learned to prepare my fruits and veggies way in advance, which makes it a breeze (about 3 minutes) to prepare breakfast each morning. For example, my freezer currently contains a bag of diced fresh pineapple, banana slices, and apple chunks, and I have strawberries and blueberries in the fridge. I have not bothered with any fancy equipment. I’ve read some blogs that say you need a super expensive blender in order to get a well-blended smoothie, but I’m not spending that much money. I use a knock-off Magic Bullet single-serving blender that my mom got me for probably less than $40. Maybe I’m missing out on incredibly well-blended smoothies, but I doubt it. To ensure that your greens blend in smoothly, blend your greens with your liquid first, and then add the rest of your ingredients. You can use any kind of greens, but each is going to be slightly different. When I get a big bunch of greens, I go ahead and wash them and store them right in my salad spinner. Then they’re ready for each morning, when I pull out a couple handfuls and rip them up just a bit while I stuff them into the blender. I learned from a little internet research that many greens, especially those from the brassica/cruciferous family (pretty much everything on my list except for spinach and lettuce) have a natural chemical that can disrupt hormone function. This is really not an issue for most people because you’d have to eat a TON of greens every single day. But since I already have thyroid problems (and my spring CSA has given me almost entirely brassica vegetables), I was a little more concerned. The good news is that cooking them can help. So for brassica greens, I wash them, rip them up a bit, steam them, and then store them in a bowl in the fridge. Then each morning I can just pull some up and stuff them into the blender. Easy peasy. Lettuce: Easiest to mask their flavor because they’re super mild. But of course, they also have the least nutritional benefits. If you’re really not sure about green smoothies, start here and work your way up to something a little more green. OR… this can be a great way to use up slightly wilted salad lettuce. I used butterhead, which was great. Romaine would be great too. 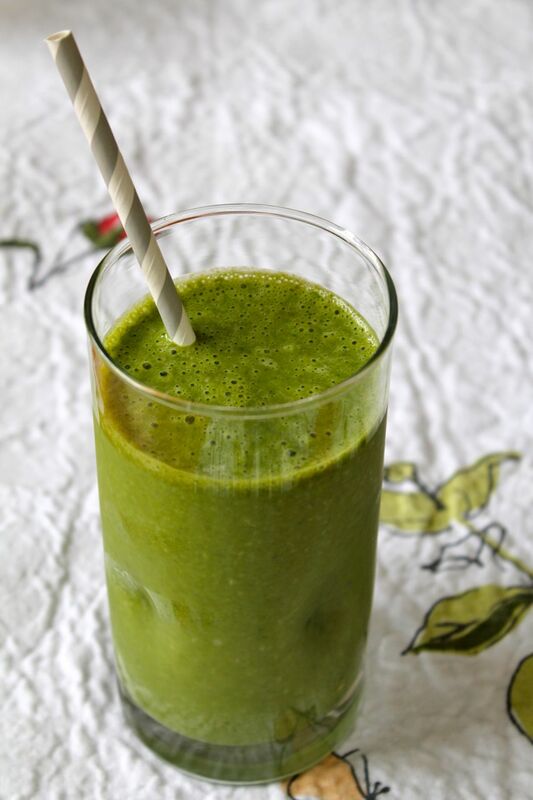 Spinach: A classic in green smoothies. More health benefits then lettuce but still an easy flavor to mask with fruits. Kale: A standard in green smoothies. Super healthy! To prepare for a smoothie, I prefer to cut the stems out before I chop them up. If you don’t mind yours a little chunky, keep the stems. They’re edible and full of nutrients. When blended, you may see some flecks, but you won’t notice any chunks when drinking. Check your teeth afterward though. Turnip greens: They blend really smoothly. They have a slightly more green taste, but not noticeable if you blend in stronger or sweeter flavors like banana and sweet juices. Kohlrabi leaves: Same as turnip greens. Collards: Same as turnip greens. Beet leaves: Really mild flavor. A great way to use up greens that you usually throw away. They will turn your smoothie pink instead of green. Mustard greens: No. Don’t do it. Gross. For the liquid, I started off with orange-peach-mango juice from Trader Joe’s. It was incredibly delicious, but a little too much sugar to start off my morning. As I grew accustomed to the green-ness of the smoothies, I started cutting back on sugars. Apple juice is a good option — it’s lower in sugar and acids. These days, I usually mix about half apple juice and half almond milk. Prune juice can also be a good option if you need some natural assistance in that department — just be careful not to overdo it. For a thickener, I always include yogurt. With that addition and the fact that I don’t freeze all my mix-ins, my smoothie comes out more like the consistency of a drinkable yogurt than a frozen smoothie. I prefer Greek yogurt since it adds more protein to my breakfast, helping me feel fuller longer and have a bit more energy. And as with the juice, I started off with vanilla or blueberry and have gradually progressed to plain yogurt, with the goal of cutting out extra sugar. Any fruit is great. Banana is the best for masking other flavors, plus it makes your smoothie a little thicker and smoother. I use pineapple with almost every smoothie. I’ve also used strawberry, blueberry, apple, and clementines — basically whatever I have laying around. I’ve also mixed in veggies, either in addition to or instead of the greens. Carrot is a great option — it goes well with apple juice and bananas. Mixing in a few leftover turnip pieces didn’t change the flavor at all but did give it a slightly powdery, grainy texture. Beets are good too — they go well with apple and pineapple. Keep in mind that some mix-ins will change the color of your smoothie, if that’s the sort of thing that bothers you. Mixing warm (red, orange) and cool (green, blue) colors will usually result in a brown color, which isn’t particularly appetizing. Though sometimes I just do it and drink it from an opaque cup. Mixing cool colors (greens and blueberries) will usually result in a cool blue color. Just think back to your elementary-school paint palette, and you’ll be fine. Okay, that is way more information than I thought I would share, so if that’s too much for you, here’s a recipe. Just try it. You’ll be glad you did. Blend the juice and greens together until greens are thoroughly chopped. Add the banana, pineapple, and yogurt. Blend until smooth. Add more juice or almond milk until smoothie reaches desired consistency. Blend well. After you try this, experiment a little! Add whatever you have and whatever you like. That’s the beauty of a smoothie — you can’t make it wrong. Enjoy! Absolutely super fabulous. i AM going to feature THIS. 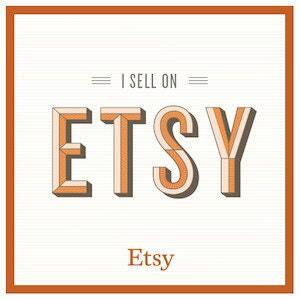 Thank you SOOO much for featuring a HEALTHY recipe in our Recipes linky party at the FineCraftGuild.com. Keep that healthy creativity coming! I love this. Thanks so much! Very excited to be featured.